The Facebook page Maharlika in its recent post, lambasted the Roman Catholic church and said that without its leaders, the country would be experiencing progress, and that the church is once again on the move to repeat its mistake. 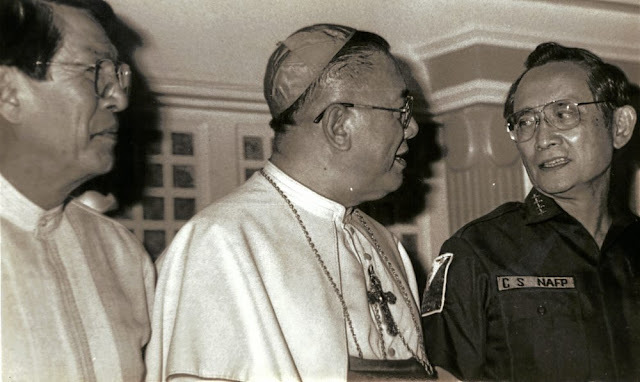 The page shared a video of late Jaime Cardinal Sin talking about how he encouraged Filipinos to join the EDSA revolution in 196. Sin, the archbishop of Manila spoke through the Church-owned Radio Veritas in in February 22, 1986 and this event is what was recognized as the spark that ignited the People Power Revolution. These “two good friends” were Fidel V. Ramos and Juan Ponce Enrile—Vice-Chief of Staff of the Armed Forces and Minister of National Defense, respectively—who had held a press conference earlier that day to announce what many Filipinos had suspected all along: that Marcos had not won in the February 7 snap elections. The two officials declared they no longer recognized the Marcos government and called on other ministers and military officers to align with them. The said revolution led to the ouster of late dictator Ferdinand Marcos. According to Maharlika, if Sin did not intervene, the country would be a better place. "Kung hindi lang nakialam ang simbahan noon, napakaganda na siguro ng Pilipinas ngayon at maayos ang buhay nating mga Pilipino." "Dahil sa panawagan ni Cardinal Sin, dumagsa ang mga tao sa Edsa na naging dahilan sa desisyon ni Pangulong Marcos na wag nang lusubin ang mga rebeldeng sundalo sa Camp Crame at Camp Aguinaldo," it added. During the 1986 Edsa Revolution; Catholics comprised 50.2 million (around 83 per cent) of 60.5 million Filipinos (National Statistics Office, 1990). At present,the church is facing a feud with President Rodrigo Duterte who has been vocally attacking the institution on the grounds of corruption and abuse by its leaders. With the verbal exchange between the parties, the blog said, "At ngayon, naging aktibo na naman ang mga pari at madre. Gusto na naman nilang ulitin ang ginawa noon." Duterte drew flak after questioning the creation story in the Christian Bible and saying that God must have been stupid for allowing temptation to destroy his work.